A peninsula is a landform surrounded by water on the majority of its border while being connected to a mainland from which it extends. The surrounding water is usually understood to be continuous, though not necessarily named as a single body of water. Peninsulas are not always named as such; one can also be a headland, cape, island promontory, bill, point, or spit. A point is generally considered a tapering piece of land projecting into a body of water that is less prominent than a cape. A river which courses through a very tight meander is also sometimes said to form a "peninsula" within the loop of water. In English, the plural versions of peninsula are peninsulas and, less commonly, peninsulae. 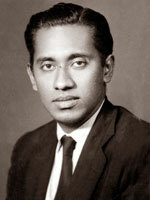 Alfred Thangarajah Duraiappah was a Sri Lankan Tamil lawyer, politician, Mayor of Jaffna and Member of Parliament. 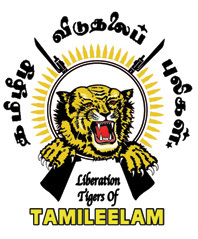 The Tamil United Liberation Front is a political party in Sri Lanka which seeks independence for the Tamil-populated areas of Sri Lanka. That night police and paramilitaries began a pogrom that lasted for three days. The head office of TULF party was destroyed. The Jaffna MP V. Yogeswaran's residence was also destroyed. Four people were pulled from their homes and killed at random. Many business establishments and a local Hindu temple were also deliberately destroyed. The office of the Eelanaadu, a local newspaper, was also destroyed. Statues of Tamil cultural and religious figures were destroyed or defaced. During the District Development Council elections in 1981, some of our party members took many people from other parts of the country to the North, created havoc and disrupted the conduct of elections in the North. It is this same group of people who are causing trouble now also. If you wish to find out who burnt the priceless collection of books at the Jaffna Library, you have only to look at the faces of those opposing us. We are giving jobs to people. We are opening industries. By the time President Maithripala Sirisena celebrates his second anniversary of assuming office, we will have completed a massive amount of development work in the North. The Jaffna Library was burnt during the time of our government. We regret it. We apologise for it. Do you also apologise for the wrongs you committed? According to Orville H. Schell, Chairman of the Americas Watch Committee, and Head of Amnesty International's 1982 fact-finding mission to Sri Lanka, the UNP government at that time did not institute an independent investigation to establish responsibility for these killings in May and June 1981 and take measures against those responsible. although no one has been indicted for the crimes yet. Jaffna Public Library being rebuilt, with partly burned right wing. At the front is a statue of Saraswati, the Hindu goddess of learning. Sri Lankan Tamils or Ceylon Tamils, also known as Eelam Tamils in Tamil, are members of the Tamil ethnic group native to the South Asian island state of Sri Lanka. According to anthropological and archaeological evidence, Sri Lankan Tamils have a very long history in Sri Lanka and have lived on the island since at least around the 2nd century BCE. Most modern Sri Lankan Tamils claim descent from residents of Jaffna Kingdom, a former kingdom in the north of the island and Vannimai chieftaincies from the east. They constitute a majority in the Northern Province, live in significant numbers in the Eastern Province, and are in the minority throughout the rest of the country. 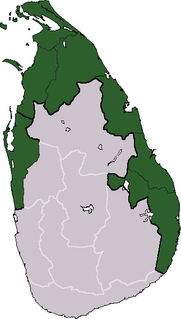 70% of Sri Lankan Tamils in Sri Lanka live in the Northern and Eastern provinces. The origins of the Sri Lankan Civil War lie in the continuous political rancor between the majority Sinhalese and the minority Sri Lankan Tamils. Before and during the early part of colonial rule by Europeans, Sri Lanka was under the rule of three separate kingdoms. War and peace was a status quo between nations, unlike the present status quo of war crimes and terrorism between majorities and minorities. During the colonial rule by Portuguese and then the Dutch, the three sovereign states were ruled as separate entities. 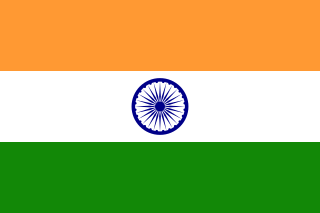 The final British colonial rule amalgamated the entire island into a single administrative entity after independence the minorities were handed over to the mercy of the majority who were warring parties before the period of the European colonisation. According to Jonathan Spencer, a social anthropologist from the School of Social and Political Studies of the University of Edinburgh, the war is an outcome of how modern ethnic identities have been made and re-made since the colonial period, with the political struggle between minority Tamils and the Sinhala-dominant government accompanied by rhetorical wars over archeological sites and place name etymologies, and the political use of the national past. 1 2 3 4 5 6 7 "Destroying a symbol" (PDF). IFLA. Retrieved February 14, 2007. ↑ "Fire at Kandy public library". BBC. Retrieved March 14, 2006. 1 2 "History of the Public Library". Dailynews. Archived from the original on March 10, 2007. Retrieved April 13, 2007. 1 2 3 4 5 6 "The reconstruction of the Jaffna library by Dr. Jayantha Seneviratne". PRIU. Archived from the original on December 24, 2005. Retrieved April 17, 2006. ↑ "Chronology of events in Sri lanka". BBC. November 5, 2009. Retrieved March 14, 2006. ↑ "EDITORIAL, DAILY NEWS". Daily News. Archived from the original on September 21, 2004. Retrieved March 14, 2006. 1 2 3 4 "Over two decades after the burning down of the Jaffna library in Sri Lanka". The Independent. Archived from the original on September 27, 2007. Retrieved March 15, 2006. ↑ Peebles, Patrick (2006) . "chapter 10". The History of Sri Lanka. The Greenwood Histories of the Modern Nations. Westport, Connecticut: Greenwood Press. pp. 133 & 134. ISBN 0-313-33205-3. ↑ Ponnambalam, Satchi (1983) . Sri Lanka: The National Question and the Tamil Liberation Struggle. London: Zed Books Ltd. pp. 207 & 261. ISBN 0-86232-198-0. ↑ "Mahinda promises compensation for high security zone". BBC. Retrieved March 14, 2006. ↑ "Prime Minister Ranil Wickremesinghe Apologises in Parliament for Destruction of theJaffna Public Library in 1981 when the UNP was in Power". dbsjeyaraj.com. December 7, 2016. Retrieved January 1, 2017. ↑ "Burning of the Jaffna Library". Amnesty International's 1982 fact finding mission to Sri Lanka. Tamilnation.org. 1 2 "Up From The Ashes, A Public Library In Sri Lanka Welcomes New Readers". NPR.org. Retrieved January 9, 2017. ↑ "Building a bridge of peace with bricks and books". The Sunday Times. Retrieved March 15, 2006. ↑ "French government donates books to the Jaffna library". Museum Security. Archived from the original on July 12, 2007. Retrieved May 3, 2007. ↑ "Jaffna library opening put off as Mayor, councilors resign". Tamilnet. Retrieved March 14, 2006. ↑ "Story of Jaffna Library". The Hindu. Archived from the original on December 24, 2007. Retrieved March 15, 2006. ↑ "Fragile Guardians of Culture By Nicholas A. Basbanes". Los Angeles Times. Archived from the original on January 29, 2007. Retrieved April 16, 2007. ↑ "History from the LTTE". Frontline. Archived from the original on October 23, 2007. Retrieved April 15, 2007. ↑ "Nancy Murray: Hyper-Nationalism and Our Civil Liberties". Democracy Now. Archived from the original on March 17, 2006. Retrieved March 15, 2006. ↑ Sunil Bastian (1999). "The Failure of State Formation, Identity Conflict and Civil Society Responses – The Case of Sri Lanka" (PDF). Brad.edu. Retrieved April 16, 2006. ↑ "How it Came to This – Learning from Sri Lanka's Civil Wars By Professor John Richardson" (PDF). paradisepoisoned.com. Retrieved March 30, 2006.